Dave Rearick has been sailing and racing the Great Lakes and coastal waters since his childhood. He has won many events, and held records including the single-handed Mackinac race from Chicago to Mackinac Island, as well as the Solo Super Mac – a single-handed race from Pt. Huron, Michigan, to Chicago (600 miles!). 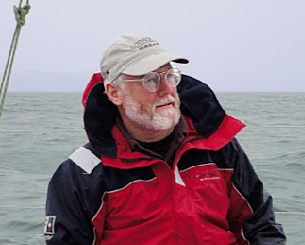 Dave began sailing at age 12 on the family Sunfish along the southern shores of Lake Michigan. He grew up racing Hobie Cats, Lasers and the Sunfish until relocating to Maine at age 20, and taking a job with the Hurricane Island Outward Bound School in Rockland. Sailing in Maine took Dave aboard more traditional craft like open pulling boats and large schooners with lots of variations in between. Since returning to Indiana in 1980, Dave has sailed and raced many boats, from J 24’s to Open 50’s on the Great Lakes and both coasts. Dave has also worked with and helped a number of other Solo Ocean Racers prepare for their races. All that will serve as valuable preparation for Dave’s plan to compete himself in the next international single-handed race around the world. Sailing accomplishments: • 27+ Chicago Mac Races • 30+ Tri-State Races • 30+ Columbia Races • 7 Solo Chicago Mac Races (Set Record in 1998 • 2 Solo Chicago-Port Huron Races (Set Record in 1999) • 4 LMSS solo Trans-Michigan Races • Newport to Bermuda Race • Montego Bay Race • Trans Pac • The Atlantic Cup Race (2012/U.S.) • Transat Quebec-St. Malo Race (2012/Canada) • Normandy Channel Race (2012/ France) • Mondial Class 40 World Championships (2012/ France) and many other races and sailing events.